We’d love your help. Let us know what’s wrong with this preview of Apocalypse Orphan by Tim Allen. A Commander Orlando Iron Wolf is aboard the International Space Station when a blinking light on his computer console alerts him to a fast moving comet headed for a collision with planet Earth. To ask other readers questions about Apocalypse Orphan, please sign up. This review has been hidden because it contains spoilers. To view it, click here. I had planned to write a comparison of the things I liked about Apocalypse Orphan then follow it up with what I did not like but I didn't get far. SPOILERS GALORE follows. This book has promise. The concept, if it were pared down to a less complex scenario, would carry far better than the chaotic mess you start with. Before I go on, though, here are some quick things that could be done to make the book better (for me, let me emphasize that this is my opinion). 1. Nomad is impressive as a world kil I had planned to write a comparison of the things I liked about Apocalypse Orphan then follow it up with what I did not like but I didn't get far. SPOILERS GALORE follows. 1. Nomad is impressive as a world killer without the pages and pages of expositions, explanations and actions that the Earth takes to divert it/destroy it. By the end of Part I, I kind of hoped it would destroy the whole solar system - like wanting the psycho killer to win in the bad horror movie. Details: one nuclear strike is enough instead of multiple, one attempt to divert/deflect it, leaving the last attempt by Wolf as the final failure instead of going on and on until I felt like screaming at the text to get on with it. Yes, I could have just skipped it, but I agreed to read the whole book not skip to the good parts. 2. Earth's descent into chaos and destruction. This is a Kitchen sink scenario pepper with every cut scene from every disaster movie I have ever seen. Again, one terrorist attack would have been sufficient, a mad scramble for resources, the attempt of one underground ark (2012) to save humanity. Instead, the book goes on and on dragging in every terrorist group from Al Qaeda to ISIL in an act of overkill that makes me feel like someone decided to combine the Titanic movie (Cameron) with 2012 and Event Horizon. 3. We spend entirely too much time with the oncoming destruction of the Earth before stopping in our tracks and saying, sorry, this story is about another story set 50k in the future and all the stuff before was someone else's story. The book could have done the same in a few concise pages and summaries of the disaster instead of way too much detail. The scientific evidence and explanations hovered somewhere between information overload and a silly sense I was in a Dr. Strangelove Parody where the director is trying to trick me into skipping all this in order to pull a fast one over on me. By the time Part I is over, I feel like I have lived through every disaster movie made from When worlds collide to Independence Day Resurgence. I would have skipped it for something simple, symbolic, emotional, an abbreviated version of Armageddon (movie) without the happy ending. The book suffers from way too much science. The story gets repeatedly lost while the Astronauts, or Houston or the fascinating Dr. Mason or her AI goes into so much detail that even an amateur science nut like myself decides not to google any of it if there's a chance we can get on with it. It boggles my mind that the main character, Wolf, is not scientifically literate enough to handle this in the beginning of the book yet becomes more literate by the end as a means of "character growth?" I ask because it's the only plausible explanation I can come up with. Wolf suffers from lengthy explanations of what makes him different. It damages his character in the long run. It like character development in a movie, we want to SEE why Wolf is a good man, not have it told to us in long flashbacks/dialogues/or third person omniscient narratives. The irony is that we do get to see it anyway through the course of the story, but by the time we see Wolf in action I feel like I have been flogged to death with all the reasons he is that way instead of just being shown it through action in the plot. One of the hardest things to do when writing a book is to decide on POV. How is the story told? The temptation of almost every writer is third person omniscient. It is a cheat in order to allow the narrator and the reader to know the thoughts of every character and their base motivations. It also destroys most good books completely. I really feel like this book would have been so much better if the whole story had been told only from Wolf's POV or at most Wolf and Nala's POV. Synthia is fascinating but too omniscient to make me comfortable. The story would have flowed better if we were to filter all the events through Wolf's perspective only from beginning to end. What he knew we would know, leaving him ignorant of the final fate of the Earth would carry him on a quest to learn that fate even as he starts to explore the new world and its denizens. Capitalizing and exploring why he is an Astronaut "savant" instead of a scientifically minded one would be more interesting that having to go through dialogues where he is told/we are told all that is necessary to be told. Instead, we should be forced to solve each mystery of why Dr. Mason's odd behaviors and motivations, her obsessive reactions where Wolf is concerned. It's the author having faith that we will diligently pursue the plot because we identify with an ignorant or misinformed hero as he desperately searches to find out what happened and why it is important to him. Next, Dialogue. Admittedly dialogue is very hard to reproduce since if you strive for real dialogue you have to acknowledge that most of us spend more time talking about mundane stuff that is both boring and does not advance any plot but still conveys our emotional states. Movies murder dialogue more than others all the time (if the actors are particularly good then it's less noticeable). Collateral (Tom Cruise/Jamie Foxx) is a good example of this conflict. The struggle in dialogue is to make characters talk like real people but reveal enough of their inner turmoil and desires to drive the story. Notice, I say story, not plot. We, as readers, care about the story, it's why we are reading this book (usually). The plot is a framework that surrounds and directs the story. We want to understand why Hakkon goes nuts and destroys everything that is good in his life, we don't want to dredge through customs and even more expositional explanations to find out the whys of it all. Having said that, the dialogue in this book is forced at best, and at worst, it has too much exposition in the regular narrative. What follows are suggestions about the dialogue rather than criticism. As you will see (if you are really reading this) I want to like this book. The potential here is enormous. 1. It would be better for me that Wolf and Syn are not honest with each other about their feelings for each other. Syn is holding back the reasons for her actions because she feels that Wolf will not, cannot, understand, what drives her to do so because she doesn't understand the programming that Dr. Mason has input into her code. This could lead to a mystery where Wolf and Syn have to travel to the Moon base in order to learn why Syn act in seemingly erratic, random ways at certain times. Wolf can be much the same as he realizes that he is falling in love with a hologram but cannot force himself to the idea that in all essence, he is in love with a mirage of a woman, dead for the last 50k years. Through the course of the story and many dialogues, their feelings could come together as they both realize that they feel pretty much feel the same way about one another. Resolving to explore a means of being together by learning why all this attraction is happening. You can still have the flirting, the close encounters, but instead of blatant attraction; you convey desire, passion and more human emotions accompanied by the need to recklessly abandon all logic in the pull that makes all of us human. 2. Second, Wolf's dialogue with the new humans is unbelievable. I get that Wolf is a talented linguist but jeepers, there's no language barrier to struggle with. He just automatically picks it all up and misses the opportunity to experience the nuances and new meanings to old words. Instead, the transition is so quick that I felt robbed of a great part of the book as Wolf learns to communicate with the locals. He could have missed the signs that Nala is not who she presents herself to be. Hakkon is really the villain that he turns out to be, and that Onel is more heroic than he pretends. That Silvaine and Johan have more character than just flat villains who delight in being evil. That Waylan is more than the other new humans, that he is lonely, that he, not only needs Wolf, but he also needs a new mate. So many things/plot twists are missed in just a simple chance that is just there waiting to be used. The dialogue was a huge problem for me. I was constantly stopping to say "who talks like this?" My answer is no one unless you are in a bad James Bond film or comic book from the 60's. I could go on but I feel like I am close to nitpicking. I am going to bring up 3 epic heroes and what sets them apart from Wolf. AND why Wolf could be all three of them. 1 Gilgamesh is the first superhero of literature (for me). He is invulnerable, super strong, practically immortal (demigod) and wise. But he is also foolish, egotistical, and almost two-dimensional, in many ways, as a character. That is until he meets and befriends Enkidu. Through his relationship with Enkidu we see Gilgamesh stop being super and become heroic even as he loses the only other person he really cares about. His struggle to rescue his friend from death and his eventual acceptance that he is not as god-like as he thinks he is; it makes him understand what it is to be human in accepting the consequences of life and death. All this makes Gilgamesh a great hero, it even makes his story worth reading and rereading. 2. Achilles. The consummate ideal of the warrior, nearly invulnerable, who like his predecessor is vain and proud but falls for a mortal man who he takes to be his best friend. He loses his friend because of his own ego, he loses his life because he cannot get over that loss (there are other reasons but I see them as minor to this central one). It is not so much that Achilles is betrayed and slain by an arrow to his ankle as he betrays himself to death. He goes through a distinct change transforming into an even greater hero by becoming mortal (for all intents and purposes). I really like what Brad Pitt did with the role in Troy. The idea of Achilles is growth, the hero stops being perfect only to realize he is far from it. 3. Sigfried (or Sigurd) and there are many stories about him, but as it pertains to Wolf, I will keep this short. Sigurd is also almost invulnerable, he is armed with nearly invincible weaponry and even rescues/courts a Valkyrie (shieldmaiden) to his side, yet he fails her in the end. I see the parallels here. This could well be Wolf and Syn. My point is that while Wolf does prove to be vulnerable it is less a character flaw than an unfortunate side effect that is almost immediately remedied (0r at least it seems to be). Wolf should take elements from each of these heroes, throw in a little of the Native American Spirit, Coyote and top it with the Bushido Code of searching for perfection and instead of a superman with some kryptonite, you find a tragic hero who must struggle as we all struggle to overcome the obstacles in the story. Finally, I have major issues with the prophecy. It's okay to have it, but it's only brought up when we have a clear idea of the role Wolf has in it. I mean there is no discrepancy- none- it's Wolf without a doubt. I would rather find out that everyone thought Waylan was supposed to be it, or Johan started out as the hero of prophecy before he was turned to evil. That Wolf falls into being the prophesized hero more than just shows up and some kid goes "hey, you are the hero of prophecy" and Wolf goes "no, I am not," but he really doesn't resist it. And I go, "of course!" In conclusion. Okay, maybe not. One more thing keeps bugging me. It's the or rather all the Deus Ex Machinas that are thrown out here. It's back to overkill. The shuttle on its own is an overpowered device but as the story continues it gets bigger and bigger with way too many rooms to fit in any shuttle and comes out feeling more like the Defiant from DS9 that a NASA variant. It also goes from a Scientific vessel to a Star Destroyer...and, I have to ask why in the hell would you build a star destroyer when there are no aliens in this book? Nomad is a big hunk of ice/rock. Nuclear missiles don't scratch it so why would you hand a star destroyer to the guy who is going out to study it? Nope, I got no answers. Then there's the laser gun and mack-mini. I don't see us having either in 10 years. They're are way too convenient, plus that are plenty of conventional firearms that would be more likely. What the hell is an astronaut doing with such ordinance when there is no threat unless you need laser guns to counter the terrorist threat (pick one of them, the books got them all -well not the IRA but almost all of them). In closing, I would rewrite this book as something simpler. There is much potential here but mainly it suffers from mass overkill and too many details that the story, which I am pretty sure it has, gets lost in all the chaos. Apocalypse Orphan is a fast moving and action-packed Science Fiction book. Commander Orlando Iron Wolf, known as Wolf, is in space when he notices a fast moving comet coming right towards Earth. Mankind tries to prepare for the deadly collision and a last minute plan sends Wolf towards the comet in a final attempt to change its course. Wolf ends up in a cryogenic freeze that lasts for 50,000 years with the help of his onboard computer, Syn. Syn can take form as a beautiful woman, but she is only Apocalypse Orphan is a fast moving and action-packed Science Fiction book. Commander Orlando Iron Wolf, known as Wolf, is in space when he notices a fast moving comet coming right towards Earth. Mankind tries to prepare for the deadly collision and a last minute plan sends Wolf towards the comet in a final attempt to change its course. Wolf ends up in a cryogenic freeze that lasts for 50,000 years with the help of his onboard computer, Syn. Syn can take form as a beautiful woman, but she is only a representation of the scientist who invented her. When he finally awakes and lands back on Earth, he finds that society has regressed to a more primitive state. Wolf must fight strange beasts, get along with these new people, and help them fight another group that is determined to take them over. He has new 'powers' as a result of the comet causing changes to his body. But he and Syn are determined to find a new life in this new Earth. I really enjoyed this book. There's a lot of technical stuff, especially at the beginning, but the science is not intimidating. Wolf is an interesting character and I really liked Syn. The people that Wolf meets are also engaging and while Wolf mostly helps them, either with his strength or with Syn's medical abilities, they also end up helping him to find himself in his new role on Earth. I truly enjoyed this book. It is the start of a great series and I can't wait to find out what happens next. This dashing tale is a traditional science fiction novel with a shading of action adventure. It is fast-paced and entertaining. The book opens well with a likable protagonist and a world in peril. After a long mise-en-scene, we follow the fortunes of Wolf as he struggles to find his place in a world unlike anything he has known. Cut off from everything familiar, with only a machine AI to guide him, he must make sense out of his new life. The problems he faces are compelling, but that's all I wil This dashing tale is a traditional science fiction novel with a shading of action adventure. It is fast-paced and entertaining. The book opens well with a likable protagonist and a world in peril. After a long mise-en-scene, we follow the fortunes of Wolf as he struggles to find his place in a world unlike anything he has known. Cut off from everything familiar, with only a machine AI to guide him, he must make sense out of his new life. The problems he faces are compelling, but that's all I will say lest I spoil the book for other readers. Overall, my main criticism of the book was that I'd have liked more uncertainty; Wolf seems to solve all his problems very easily, and there was a bit too much of the superman about him for my taste. Like all superheroes, he does have his Kryptonite, but this doesn't appear until near the end of the book. More doubt about whether he could survive would have made the book more exciting for me. The cliffhanger ending infuriated me. I know that this is often done nowadays, but I dislike it and felt it was out of place in a novel that should have stood alone. All the same, an entertaining read. This sci-fi novel is unlike anything I have ever read. It was SO FUN to read!!!!! I received a free copy in exchange for an honest review. There were so many levels to like and enjoy! From mythological creatures, to love triangles, action sequences, awkward moments that made me cringe and yet love the book even more.There were moments I didn't like what was going on, moments I laughed, cheered, and rooted for Wolf. Who is a super-hero on so many levels...... I would read it again!! I CANNOT WAIT This sci-fi novel is unlike anything I have ever read. It was SO FUN to read!!!!! I received a free copy in exchange for an honest review. After many many distractions, I was finally able to finish this astounding book! I was given an ARC of this book in exchange for an honest review and honestly I couldn't put this down (Except when I had to put this book down) I am a person who very much enjoys sleep but last night I stayed awake until 5:30am just to finish this book. I tried to go to sleep but it kept on pulling me back in. When reading this book you can never feel safe there's always some turn to keep you tearing through those After many many distractions, I was finally able to finish this astounding book! I was given an ARC of this book in exchange for an honest review and honestly I couldn't put this down (Except when I had to put this book down) I am a person who very much enjoys sleep but last night I stayed awake until 5:30am just to finish this book. I tried to go to sleep but it kept on pulling me back in. When reading this book you can never feel safe there's always some turn to keep you tearing through those pages. Commander Orlando Iron Wolf is now an astronaut, floating through the cosmos, he is given a special mission to go into a solo pod and reprogram a satellite. However, a comet is seemingly racing towards earth and getting closer with every second. Every hope is set on the comet hitting the moon and all impact being lost before it can reach earth, however, the scientists know otherwise. Humankind attempts to prepare for the impact whilst the brave Wolf heads towards the deadly comet in an attempt to change its course. When Wolf is dragged into the comet's gravitational pull his last hope is to enter a machine called the DSC or Deep Space Chamber in which his will be trapped in a cryogenic freeze for over 50,000 years. When he awakes the Earth is very different from what he once knew. Science has never been my forte but when reading this book I found myself staying behind after class to ask about the universe and the odds of a comet destroying earth as we know it and evolution and just basic words I couldn't even understand, words I wanted to understand. Beneath all the science is an amazingly terrifying book that left you asking all these questions. This book had so many layers, romance, mythological creature, science technology, and action, I feel like it's a book anyone could pick up and enjoy. I thought Wolf was an extremely intriguing character and his 'dummy talk' really helped me out at times. However Syn really stood out to me, as a sort of super computer with a deeper view of life and feelings than most beings with a heartbeat. This new version of almost primitive earth was so fun to read about and easy to latch on too, time travel to the past in the future, I cannot wait for the sequel! 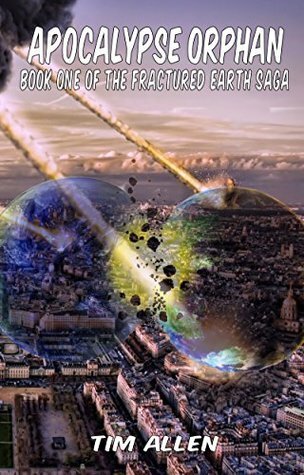 This book deals with a very real fear- the fear of asteroid impact wiping out the human race. And that is about as far as it gets in terms of scientific accuracy. With all due respect to the author, it seems that a majority of the research for this book was done by watching 'Armageddon', 'Deep Impact', and other such 90's blockbusters, mixing the plot points together, and then calling it good. Several plot devices seem to be shamelessly ripping off the aforementioned films- undergr In a word: No. I am all for suspension of disbelief, but this novel was asking for too much suspension. According to this book, the moment that an incoming object is discovered the worlds leaders immediately abandon all actual thought and communication in favor of a slapstick worthy routine of flailing, terrible planning, and of course the usual 'bunker set up for the elite' that seems to appear in any piece of media with an end of the world scenario. And then we come to the protagonists. To start off: 'Iron Wolf'. The name alone should tell you that we aren't going to get a balanced, realistic character here. Why not just call him Captain Awesome? I realize that the character is a Native American- which only serves to increase the lack of realism in this case- but come on. Then we get a run down of his achievements- Ugh. So he just happened to earn the Air Force Medal of Honor? Does the author even know what that means? He is bad at math and engineering but good with languages- and becomes part of an award winning ENGINEERING team that builds a rover prototype, which allows him to catch the attention of NASA. Riiiiight. Add that to the fact that he is ridiculously attractive, intelligent, and noble, and you have a nearly perfect example of the Gary Stu. He is accompanied by a brilliant, beautiful young woman who is so smart that she invents an interstellar drive within months, is hopelessly in love with (sigh) Iron Wolf, and is constantly ridiculed for no reason other than being a woman. At one point she is called 'young lady' by another scientist, and asked a relevant question. She angrily responds with 'it works by heat, light, and pressure... And other things that I don't have time to explain." Which apparently shows she is brilliant. Thanks to the great people at Book Tasters, I was given a copy of Apocalypse Orphan by Tim Allen to read and review. Suffice to say there were a lot of ups and down about this book that I'm going to cover. First though, one of the biggest things I wanted to note is how much work the author put into a 100,000 plus book, and it shows. It has been a long time since a book pulled me into the world especially with what was pretty much along prolog to the main story. W Thanks to the great people at Book Tasters, I was given a copy of Apocalypse Orphan by Tim Allen to read and review. Suffice to say there were a lot of ups and down about this book that I'm going to cover. First though, one of the biggest things I wanted to note is how much work the author put into a 100,000 plus book, and it shows. It has been a long time since a book pulled me into the world especially with what was pretty much along prolog to the main story. Without giving too much away, the description of Earth several hundred thousand years later after an asteroid impact was quite catching and opened my imagination to a lot. Being able to explore the world was quite a fun part of the book. I actually closed my eyes and stopped reading to see if I could imagine the destroyed Earth that was healing itself and the new mini-world orbiting it. The descriptive ability of Tim Allen is quite strong. Not to sound harsh but the hardest part of the book was the characters. The novel struggled when it came to giving characters that I could care about as the main hero was so perfect that there was no way to relate to him and no weakness. I had a hard time keeping my interest and only found the computer that is featured to be of interest, but even that felt like it was following a stereotype instead of being a full character. There are also a quite a few plot holes about how an entire civilization couldn't advanced technology but less than two years come up with interplanetary travel and not giving the hero any real weaknesses. My review is on the work itself and not that of the author. I think he has a lot of potential and working on plot holes and making better characters is a firm step towards producing a solid story and making it better. I actually will be looking for his next book, so I can keep up and see what type of work he does next. Apocalypse Orphan was an intense, action-packed science fiction book that I couldn’t stop reading after the first page. The story begins with Iron Wolf preparing for the worst as a massive comet is aimed straight for Earth. Wolf last minute thinking leads him into the future, after being frozen for thousands of years. Now Wolf is immersed into this new Earth where everything has changed and new fascinating and intimidating beasts are ready to fight. With Wolf and his computer Syn, they try to find a new life in this new Earth and it brings the readers through a world wind of a journey. I enjoyed this book, but I wished there was more room for the imagination of the reader. It’s hard to paint a vivid picture of your own view of a world when too much detailed is added. I also feel that it becomes a distraction with the plot. In terms of character development, I loved how they made Syn seem almost completely human. At times, it felt like she had more emotion than the protagonist Wolf. Both characters had good development and I was able to enjoy their struggles, accomplished and growth. Although I would have enjoyed seeing more weakness in Wolf. He gave me superhero/invincible immortal vibes at times. When it comes to Science fiction, I am all for the world-building. The world must feel captivating to me. I thoroughly enjoyed how the author was able to visual Earth thousands of years after the comet episode. The author gave enough of the world build for the reader to expand on that idea. However, I think there needs to be a little more development with the science part of it and since this is a saga, I hope to see this become better with time. Overall, this book was a pretty good read and I look forward to reading the second book in the Fractured Earth saga. A good book, very imaginative and creative, that is 'Apocalypse Orphan' - the first book of the Fractured Earth Saga. Now many people have this complaint that it is not factually correct, but tell me, whichever fiction (Science fiction or not) has ever been factually correct. "Non-fiction" is the genre these disapproving people need. Now to the review, I find this book very engaging and entertaining. The imagination and creativity of the author is very well commendable. The plot of the book alon A good book, very imaginative and creative, that is 'Apocalypse Orphan' - the first book of the Fractured Earth Saga. Now many people have this complaint that it is not factually correct, but tell me, whichever fiction (Science fiction or not) has ever been factually correct. "Non-fiction" is the genre these disapproving people need. Now to the review, I find this book very engaging and entertaining. The imagination and creativity of the author is very well commendable. The plot of the book along with the various scenarios that the author creates are highly original and the characters are well crafted as well. As for me, I absolutely love Wolf and Syn even if they may appear as clichéd to some. But tell me, what isn't ever clichéd? The author has given some thought to the story and all the characters that he has creates and has produced a much readable and enjoyable book. The book is absolutely fast-paced and thrilling and the adventures of the protagonist are quite exciting. After his return to Earth with some special powers, he sees that the earth and it's inhabitants have changed rather drastically, and this is where the other characters, the protagonist's friends, come into play ad they help him to adjust and adapt. I was given this book for free in exchange for an honest review, so here it is. While far fetched, this book kept me coming back for more. The main character, Wolf, wakes up after being cryogenically frozen for 50,000 years. The world he wakes up to is quite strange and he has only his AI named Syn to help him find his place in it. After being told that he is the fulfillment of a prophesy he finds himself protecting people he comes to care about. But there is an enemy who has weapons comparable to I was given this book for free in exchange for an honest review, so here it is. After being told that he is the fulfillment of a prophesy he finds himself protecting people he comes to care about. But there is an enemy who has weapons comparable to Wolf's and his attacks become more and more dangerous. I thought this was a fabulous read. I loved the 'science' in this book, although it's obviously fantastical as opposed to factual. So, a sci-fi-fantasy I could just sit back and enjoy. It had some great characters, some interesting dilemmas, and was an all round enjoyable read. There was a bit of a cliffhanger, but to be honest, I saw that possibility coming as it was foreshadowed in the (very) latter stages of the book. I particular loved the modern technology use within a sort of stone-age and I thought this was a fabulous read. I loved the 'science' in this book, although it's obviously fantastical as opposed to factual. So, a sci-fi-fantasy I could just sit back and enjoy. It had some great characters, some interesting dilemmas, and was an all round enjoyable read. I would recommend this book to anyone who loves sci-fi and love stories.Thia is a true work of art. When the next book has finely been realeast I will buy it and any other releases in the series. The author has truly made me feel like I have read one of the most interesting and greatest love story. This was a very hard book for me to start. A lot of space talk that left me zoning out. Then it ends up like living in Medieval times- mostly. We are told things but don't connect with the characters for much of the book. After half way through we start to like the characters and the story gets better. The ending is a huge "WTF" and I wonder what happens next. Warning. There is much death and destruction. This book is about a man, Wolf, who gets stuck into a comet and comes back to future Earth, 50,000 years later. The Earth has changed, due to the comet collision, and he finds himself a stronger man and, I guess, the comet has made him basically invincible, except for one thing. You must read to find out what. I enjoyed reading this book, the romance is kind of weird and hilarious however. Story started out just fine, depicting the behavior of mankind facing an apocalyptic event. Then we get into really weird made up events where the author is making up the story as he goes along. Story structure is very similar to a junior high students writing. Glad I got this for free. Would of been mad at myself if I had to pay for it. This review has been hidden because it contains spoilers. To view it, click here. My kind of book: end of the world, space travel, and time travel (sort of). Not the story I was expecting with this title, even after reading the synopsis: the “orphan” is an autonomous adult and the apocalypse was 50,000 years ago. Part of the distant future story that I found frustrating: women are still seen as something other than fully human, without full agency over their own lives and bodies. Females are still classified as they are perceived by men and by their relationship to men. This i My kind of book: end of the world, space travel, and time travel (sort of). Part of the distant future story that I found frustrating: women are still seen as something other than fully human, without full agency over their own lives and bodies. Females are still classified as they are perceived by men and by their relationship to men. This is more than frustrating; it is depressing. Things that make me go hmmmm: Wolf coming back to the earth after 50,000 years, as well as being genetically altered from all the time spent in space, makes me think of how we got our mythologies of super-human gods. For the reviewers complaining of too much science or science that is not probable: Apocalypse Orphan is categorized as Sci-Fi and have you heard of Jules Verne? And, yes, the events are “made up,” that is the “Fi” part of Sci-Fi. My one negative: I do not like the font used on the cover. Petty but true. I did love the description of what precipitated the apocalypse and all the preparations made to save some of humanity for the future. What happened on Earth 2? Where did the surviving Savior ships end up? This was an interesting book to read. One of things I love about good science fiction is when the science makes sense. A good example of this in Apocalypse Orphan is that a lower Earth gravity would impact the human body. While I haven’t done a lot of research into this field, I do understand why the humans of 50,000 years into the future were much shorter and weighed much less. The author did an excellent job explaining what was happening on Earth during the two years between the comet’s discov This was an interesting book to read. One of things I love about good science fiction is when the science makes sense. A good example of this in Apocalypse Orphan is that a lower Earth gravity would impact the human body. While I haven’t done a lot of research into this field, I do understand why the humans of 50,000 years into the future were much shorter and weighed much less. The author did an excellent job explaining what was happening on Earth during the two years between the comet’s discovery and the impact. He described what could very likely happen in real life (should such an event ever occur), with countries working together to save a small portion of humanity, but also countries and terrorists fighting against each other for the little resources that remain. Humanity had basically dissolved into utter anarchy by the end of the two years. Commander Orlando Iron Wolf kind of fell short for me. He’s a likable enough character, but someone nicknamed him Captain America in the first chapter and I kept thinking about how apt a nickname that was for him. He is 6’5”, very much in shape and very intelligent, had been in the Air Force and was an astronaut for NASA, and eventually becomes a man out of time. I found that I grew somewhat bored of his character and was much more invested into what was happening around him rather than to him. I did think that it was very refreshing to have a Native main character, however. You can easily tell how much he values that side of him and I absolutely respect that. One of my biggest problems with this character is that I don’t believe that he’d ever be chosen to be an astronaut. Orlando is a master of linguistics, which I think coupled with his heritage would be enough to get him onto one of the colonies escaping Earth before its destruction, but instead he is an astronaut with no science knowledge whatsoever. I just find it extremely hard to believe that NASA would ever send someone like Orlando into space. Another issue I had was that he was… too perfect. He’s an extremely selfless person that uses his new powers for good. It could be just me, but I prefer a main character with some flaws. Flaws mean that the character can grow and develop into a better character. The premise of the book really reminded me of the Safehold series by David Weber. Orlando and Merlin were both survivors of the human race that eventually returned to a human race that had regressed to the Iron Age, bringing advanced technology with them to steer the future of humanity. That plot alone is really good, but I feel like Apocalypse Orphan falls a little short. You won’t be able to convince me that humanity would still be in the Iron Age after 50,000 years, even if civilization had to restart from scratch. I’m sure there may be some very good reasons why technology hasn’t advanced as much as it should have, but 50,000 years is a very long time. 5,000 would be a bit more believable. I also could not get behind the idea that Orlando had become a superhuman during his 50,000 years exposed to the comet’s radiation. I would understand increased strength due to his body being used to the stronger Earth gravity, but apparently the radiation caused his skin to become unbreakable (think Marvel’s Luke Cage here) and his rib cage to meld together to form a shield over his chest. He also appears to be unable to drown, which I found odd because his body should still require oxygen. One of the little things that the author does that I liked was that the language was slightly different to read. Because the language had obviously evolved over the 50,000 years, there were a few minor changes. The humans of this world speak in very short statements, I kind of read it as being a little monotone as well. It’s a little touch that I appreciated. Orlando’s ship AI, Syn, kind of creeped me out to be perfectly honest. ‘She’ did all of the things that a good AI should be doing, but she had developed feelings for Orlando during their 50,000 years in space. While Orlando was in suspended animation, Syn was quite active and was reading/showing videos to him the entire time. I do understand that Syn is based on the mind of the doctor that created her and that this doctor had a crush on Orlando, but I did find it a little odd that these feelings transitioned to the AI. What was even more odd to me was when Orlando suddenly said “I love you” to her in the first half of the book. I don’t think Orlando would have been with her long enough to develop those feelings for her along with the fact that she is not a human. There are so many things about this book that I have a problem with that the best way to put it is. I regret the time that I spent reading it and I am glad that I finally made the decision to stop reading it. Seriously I don't understand how the author even graduated high school with his demonstrated level of understanding for the basics of science. This is not a good book. The setting may have potential, but the plot is being dragged down by author inexperience and excessive wish fulfillment. There is hardly any subtlety in the descriptions at all, and all the characters seem one-dimensional. Interesting story. Author needs more practice in the craft of writing and sentence structure.